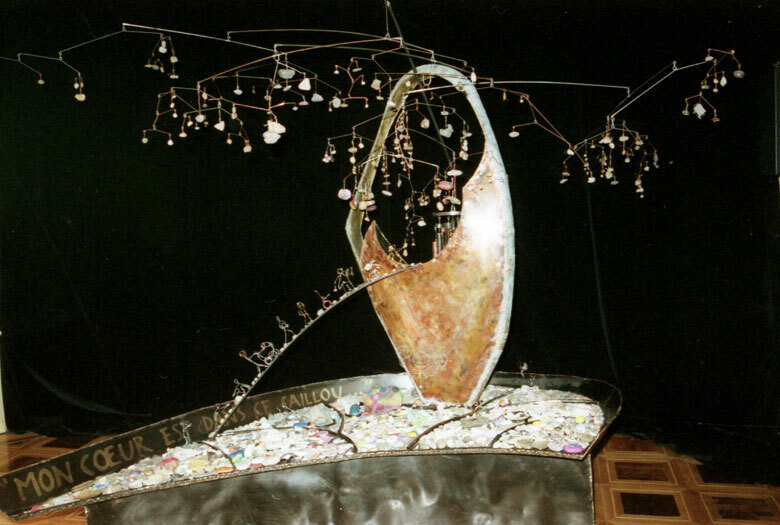 This is the story of a sculpture made of small stones collected from children around the world who are part of Tapori, the ATD Fourth World children’s network. In the main entrance hall of the United Nation’s Human Rights Building in Geneva, is a marvellous shiny sculpture. The sculpture comes from the ATD Fourth World children’s branch, Tapori. It was a gift in 1999 from children who came to Geneva in worldwide delegations to send a message for the 10th anniversary of the Convention on the Rights of the Child. The children wanted to create a sculpture that would touch everybody’s heart and encourage more peace and respect in the life of every child on earth. The children sent a message about their dreams to the adults at the UN in Geneva: “A huge sculpture has to be made for peace! […] Do not feel guilty when you look at this sculpture, but find strength in it and recognize that children help adults.” The adults wondered if they could ever match the dreams of those children. Then Philippe appeared on the scene, an artist from the former mines in northern France. Much later it became clear that he was the one who created this unique work of art. He was after all once a child, locked up, humiliated and negated. As a child he struggled on a daily basis to experience moments of peace and acknowledgement. He came up with a masterpiece welcomed by the UN High Commissioner for Human Rights with a great deal of emotion. I still see Philippe with pliers in his hand, cutting the silver wires to gently wrap each little stone so he could fix it in the mobile, in the tree of the dancing earth vessel, now surrounded by many adults and children. I can also see Philippe in my mind’s eye, a 7-year old boy, running away in the dark. Already in those days holding pliers in his hands, cutting the grid in front of the cubby where he was locked in, to escape and watch the stars on top of the hill and find peace. Today, the UN magic tree in Geneva seems to be dancing very slowly. People stop and look at it. For example school children with their teachers, groups of visitors, an employee holding her baby in her arm, looking very happy and trying to touch the mobile to trigger the bell. By constantly finding its equilibrium, this magic tree is an attempt to balance our chaotic world again, with the help and contribution of all those who come to look at it every day. * These stories are described in the book, Mon coeur est dans ce caillou.